Who will fire the opening shot in the Battle for Damascus? Lebanese journalist Nasser Sharara, who usually plays a go-between role for the Syrian regime and its al-Akhbar daily mouthpiece in Beirut, says this has been the $64,000 question in Syria since early March. Regime and opposition plans for the Battle of Damascus were an open secret seven weeks back. But the “Syrian army has now fortified Damascus with four walls,” Sharara writes today in a researched (or planted?) news analysis for al-Akhbar, which Hezbollah’s news portal al-Manar reproduces verbatim. In early March, the opposition could only gain access to the capital’s administrative center by having rebels in Jobar, a suburb on the outskirts of Damascus, storm al-Abbasiyeen Square. If regime forces wished to launch a preemptive battle for Damascus at the time, their first step would have been to blitz Jobar in the east, which is 700 meters from al-Abbasiyeen. Jobar “feeds” from Douma and Harasta in the east and from Darayya, in the Western Ghouta. Darayya is a logistical supply line, through the groves of Kfar Sousa, to key rebel strongholds south of the capital. In the past three weeks, however, the opposition tried to improvise an unforeseen strategy to break the military deadlock. It mobilized “sleeping cells” of rebels in Barza and Ruknuddin (where most residents are either Palestinians or Kurds) to infiltrate the outer reaches of Mount Qasioun overlooking Damascus. Mount Qasioun is home to the army’s largest encampment for artillery and missile systems Damascus has ever known. The planned rebel infiltration, which could have taken the army by surprise, was thwarted by a last-minute military intelligence tip-off. The army has since braced for defending Damascus from surprise attack either by the rebels or by outside forces like NATO’s. The walls go from the city center outward to the frontlines in the Damascus suburbs. The innermost wall is manned by the Republican Guard and tasked to protect Mount Qasioun proper. The 4th Armored Division and the People’s Army, now fighting rebels on the outskirts of Damascus, or what is called “contiguous Rif Dimashq,” jointly man the second wall. The People’s Army is in charge of the third wall. Military intelligence is staffing the fourth and last wall all along the Rif Dimashq frontlines. Two weeks ago, the regime ordered army command to initiate the preemptive battle for the city-governorate of Damascus and the belt of districts and sub-districts in Rif Dimashq. 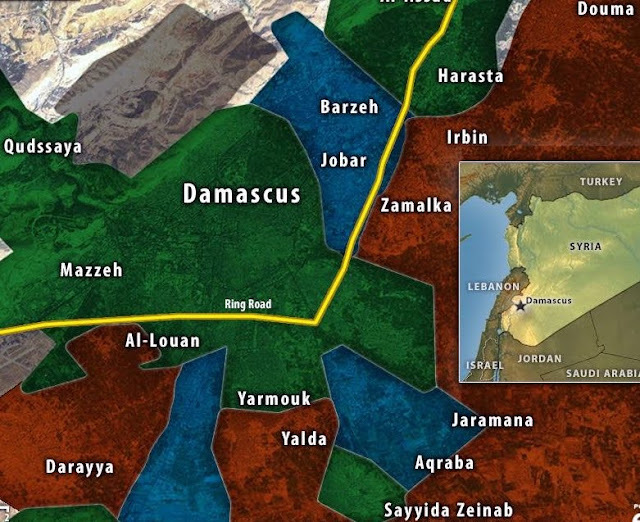 The army’s plan this time is not to push the rebels back from areas they control, but to fence them in before finishing them off within a specified time frame. “According to sources close to the Syrian army, the envisioned Damascus battle scenario currently underway will take the following course: After Darayya, the armed forces turned to Moadamia. They will then head to Qatana, where rebels are few, and subsequently to the groves of Kfar Sousa and al-Liwan – two areas now being used by rebels to lob mortars at Damascus city. “After clearing Kfar Sousa and al-Liwan, the armed forces will storm the neighborhood of al-Qadam to reach the top of the renowned Damascus thoroughfare known as al-Thalatheen Street adjacent to the Palestinian refugee camp of Yarmouk and the districts of al-Hajar al-Aswad – all in the capital’s south.